Who owns this landscape? The millionaire who bought it or the poacher staggering downhill in the early morning with a deer on his back? Who possesses this landscape? The man who bought it or I who am possessed by it? The Assynt crofters touched something deep in the Scottish soul and began the modern push for land reform. It all started 10 years ago when they bought the land on which they lived and worked from a bank after the Scandinavian property developer which owned it went bust. The purchase of the 21,000-acre North Lochinver Estate in Sutherland by a trust formed by about 100 crofters was a new dawn in land ownership in the Highlands. Backed by the government and public support the crofters of Assynt raised �300,000 to buy back what they considered to be the land of their forefathers. It inspired other communities to follow. The islanders of Eigg and Gigha, and the people of the Knoydart peninsula are among many communities who have followed Assynt's lead. John MacKenzie, who was vice-chairman of the Assynt Crofters' Trust at the time of the buyout, said one of the main advantages was "freedom". "The ability to make one's own judgements, what is best in terms of the management of the land and the ability of crofters, without reference to an absentee landlord or his agent, to come to their own decisions," he said. 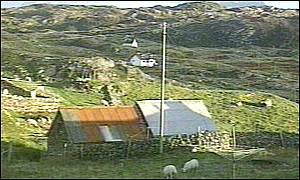 Now the law has been rewritten to make it easier for crofting communities to gain the ownership of the land they work. Critics of the Land Reform (Scotland) Bill compared the ability of crofters to purchase land that is not for sale to the "land grabs" in Robert Mugabe's Zimbabwe. The Scottish Tories branded the land reform proposals "revenge for the Highland clearances". Glasgow MSP Bill Aitken said it was social engineering "last seen in Marxist Cuba or North Korea". However, Andy Wightman, the author of Who Owns Scotland, said the right-to-buy was far from a Stalinist purge. He pointed out that the absolute right-to-buy will be extended to a small percentage of Scotland's land mass. In most cases, the right-to-buy will only become available when land is put up for sale. Mr Wightman said: "The community right-to-buy only comes into effect when a landowner is willing to sell and half of Scotland has not been on the market for over 100 years. "So, I don't think it is going to achieve the kind of impact on the pattern of land ownership that the Scottish Office, prior to devolution, and the current executive have on occasions argued that it will. "That, I think, requires more fundamental change."